Puget Sound Fishing has abundant and consistent fishing opportunity year-around. The Puget Sound is a complex estuarine system of interconnected marine waterways and basins, with one major and one minor connection to the Strait of Juan de Fuca and the open Pacific Ocean. The Puget Sound extends approximately 100 miles from Deception Pass in the north to Olympia, WA in the south. Its average depth is 205 feet and its maximum depth, off Point Jefferson between Indianola and Kingston, is 930 feet. The depth of the main basin, between the southern tip of Whidbey Island and Tacoma, Washington, is approximately 600 feet. The term “Puget Sound” is used not just for the body of water but also the Puget Sound region centered on the sound. Seattle is the most populated city situated on Puget Sound. 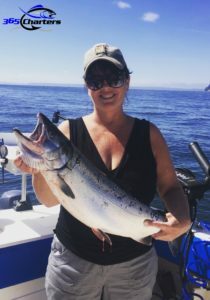 365 Charters offers Salmon, Lingcod, Sturgeon and bottom fish charters in the Puget Sound. Contact us now to book your trip. Puget Sound is home to numerous species of marine invertebrates, including sponges, chitons, clams, sea snails, sea anemones, limpets crabs, barnacles starfish, sea urchins, and sand dollars. Dungeness crabs are throughout Washington waters, including Puget Sound. Many bivalves occur in Puget Sound, such as Pacific oysters and geoduck clams. There are many seabird species of Puget Sound. Among these are grebes such as the Western Grebe; loons such as the Common Loon; auks such as the Pigeon Guillemot, Rhinoceros Auklet, Common Murre, and Marbled Murrelet; the Brant Goose; seaducks such as the Long-tailed Duck, Harlequin Duck, and Surf Scoter; and cormorants such as the Double-crested Cormorant. Puget Sound is home to a non-migratory and marine-oriented subspecies of Great Blue Herons. Bald Eagles are a common sight in the Puget Sound region. Wales can be seen in Puget Sound. Gray Whales can be seen between Mar – May , Orcas and Minke Whales can be seen Apr – Sep, and Humpback Whales can be seen Sep – Nov.
Puget Sound is a large salt water estuary, or system of many estuaries, fed by highly seasonal freshwater from the Olympic and Cascade Mountain watersheds. The mean annual river discharge into Puget Sound is 41,000 cubic feet per second, with a monthly average maximum of about 367,000 cubic feet per second and minimum of about 14,000 cubic feet per second. Puget Sound’s shoreline is 1,332 miles long, encompassing a water area of 1,020 square miles. The size of Puget Sound’s watershed is 12,138 sq mi. “Northern Puget Sound” is frequently considered part of the Puget Sound watershed, which enlarges its size to 13,700 sq mi. Significant rivers that drain to “Northern Puget Sound” include the Nooksack, Dungeness, and Elwha Rivers. The Nooksack empties into Bellingham Bay, the Dungeness and Elwha into the Strait of Juan de Fuca. The Chilliwack River flows north to the Fraser River in Canada. Tides in Puget Sound are of the mixed type with two high and two low tides each tidal day. These are called Higher High Water (HHW), Lower Low Water (LLW), Lower High Water (LHW), and Higher Low Water (HLW). The difference in height between the Higher High Water and the Lower Low Water averages about 0.3 feet at Port Townsend on Admiralty Inlet, but increases to about 14.4 feet at Olympia, the southern end of Puget Sound. A group of sailors led by Joseph Whidbey, part of the Vancouver Expedition, found and mapped Deception Pass on June 7, 1792. George Vancouver gave it the name “Deception” because it had misled him into thinking Whidbey Island was a peninsula.